Mini-Kitchens & Hospitality Centers for Any Room! YesterTec, the first company in the country solely dedicated to producing kitchen workstation furniture, is also the only company in the industry to develop revolutionary, patented technology that allows cooking appliances to be safely hidden when they are not in use. Although refrigerators and some dishwashers have been concealed in cabinetry for years, YesterTec has developed and patented the necessary technology to conceal everything – from ovens and cooktops, to any dishwasher, or even microwaves and warming drawers. With YesterTec, it’s now possible to take control of your kitchen’s visual design. YesterTec’s U.L. Listed Workstations completely and safely conceal standard, full sized ovens, microwaves, cooktops and dishwashers behind flipper doors. This innovative technology conceals today’s state of the art appliances so they don’t interfere with the timeless character of the furniture and ultimately, the design character of the room. Concealing technology gives the homeowner the opportunity to ‘chose what they want to see, instead of being told (by appliance manufacturers) what they must see’. The doors concealing the appliances become a canvas where homeowners can add stenciling or wood detailing as an additional design feature. By offering heirloom-quality, stand alone kitchen furniture that completely hides these elements, YesterTec has greatly expanded the design possibilities of the modern kitchen. YesterTec Workstations Meet Stringent U.L. Safety Standards. In order to preserve the integrity of their beautifully handcrafted kitchen furniture, YesterTec sought out a solution to the challenge of safely concealing the ‘hot’ kitchen appliances, such as full-size ovens, in wooden enclosures. The resulting technology completely hides appliances behind pocket doors that swing out and slide back into the units. To ensure safety, concealed appliances within YesterTec workstations can only be turned on when the doors are open. When concealing the ovens, the pocket doors actually are locked until the appliance has had a chance to cool off. The system can operate with most brands of appliances and does not alter any appliance in any way so that the appliance’s warranties are maintained. And each of the pieces with heating functions is approved by Underwriter Laboratories, which makes YesterTec the only company in the country with concealed-appliance kitchen workstations that meet the rigorous U.L. safety standards. This ensures YesterTec furniture will meet building codes in the U.S or Canada. Plus, the units have exceeded all standards in longevity testing. Paths To The Past. YesterTec’s groundbreaking technology keeps the technical look of appliances from interfering with the timeless character of its workstation furniture and ultimately, the design character of the room. For older homes where vintage styling is desired, these units are great at concealing modern looking appliances. 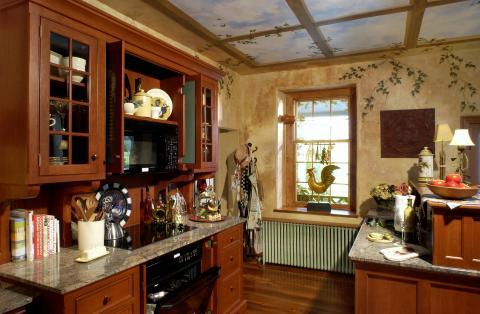 From Arts & Crafts to Traditional, the YesterTec units can be specified to match most kitchen decors. Now you can create a kitchen that suits the age of the house but is also very livable for today. Sink units completely hide any type of dishwasher. Range and oven units completely hide ovens, microwaves and in some cases even cooktops. And refrigerators are concealed within large food storage pantries. YesterTec workstations capture the look of times gone by while incorporating the function of today’s most advanced cooking technologies. 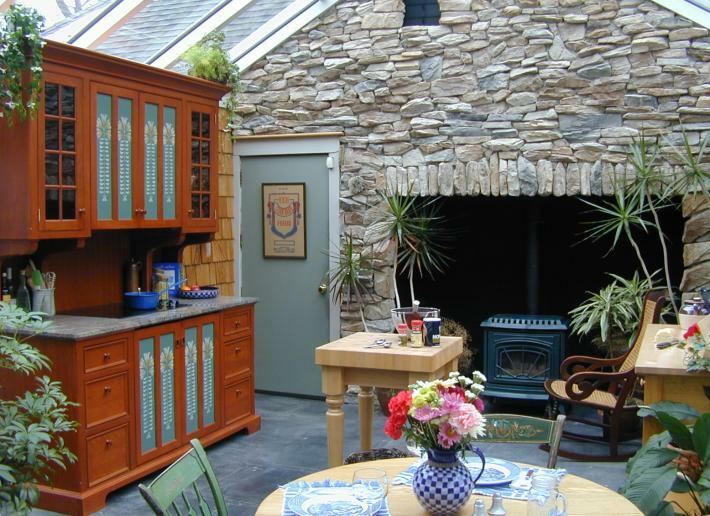 Other non-compromising design techniques include pantries that hide small electrical appliances that also provide concealed storage and work space. In addition, some of the pieces function as desks and entertainment centers that hide multimedia and information age equipment. From period design kitchens to multi-purpose rooms, whatever the homeowner’s intent, it can be carried out uncompromised with YesterTec’s stand-alone, heirloom quality kitchen furniture. And if a homeowner does not wish to conceal the appliances, YesterTec also designs workstations to complement standard appliances (such as the trendy commercial style stainless steel ranges) in a way that brings the entire ensemble into the balanced and proportional world of furniture. Let Us Help You With Your Next Kitchen Project! We'll work directly with you, your designer or contractor to help you plan an alternative kitchen design using our products instead of built-in cabinetry. Can't find what you're looking for? Use the search tool below to direct you to the right place.